The Anatidae family includes all species of duck, goose and swan. They can be found on most continents and islands except Antarctica. There are about 146 species divided in 40 family groups called genera. Some of them migrate to warmer climates before winter settles in the territories which formed their natural habitat until that moment and subsequently they often return to the same place the following year. A few species have become extinct due to climate changes and human intervention in their habitats. For those threatened with extinction, there are several organizations trying to prevent such an outcome through measures of preservation. The duck is the shortest bird from the Anatidae family. It has a long and broad body shape perfectly adapted for aquatic life. The neck is short, but strong. The short and pointed wings supported by powerful muscles enable ducks to fly. Some species have rich colorful plumage like the males of northern types, while New Zealand Paradise Shelduck females display the same attire. The goose is a medium sized bird from the Anatidae family. Its neck is long and geese have very strong feet. The elongated body shape serves for swimming as well as for flying. 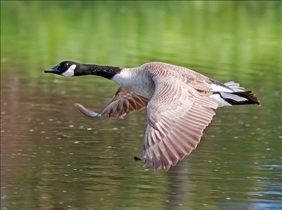 A goose has larger wings able to balance the weight of their body. A duck can feed on grass, fish, insects, underwater plants, worms, small frogs or small mollusks. Its strong beak features a pecten structure which looks like a comb brush. It serves to capture food and filter it from water. Some species feed on the surface of the water such as dabbling ducks, while others ducks submerge completely to find food. The beak is the tool ducks use for dredging feeding as well. They can easily pull worms, plants or frogs out of mud. A goose can eat grass, insects, fish, aquatic life plants or grains. For this it uses the strong beak as well as swimming and diving skills. Ducks are farmed for feathers, eggs and meat. 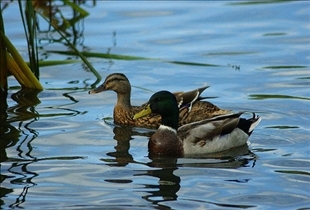 Domestic and wild ducks are consumed worldwide, some cultures having special recipes for cooking it. A long lasting hunting tradition entails shooting wildlife ducks for sport when they are flying. Geese provide eggs, meat, feathers and fat. The duck or goose liver is used to make the French “foie gras” delicacy. This is appreciated by the gourmet community as a premium product. Feathers from ducks and geese are usually used for winter bed coverings and as pillow stuffing. A duck is smaller than a goose. Their body shape has adapted to aquatic life. The duck as well as the goose can eat various types of food: grass, worms, small aquatic forms like frogs and fish. Their strong beak has an important role in the feeding process. People use duck and goose eggs, feathers and meat. Which bird lives in larger colonies? Hamster vs. Guinea Pig: What's the difference? Water Moccasin vs. Cottonmouth: Know Your Snakes! Hippopotamus vs. Rhino: What's the difference? Flying Ants vs. Termites: How are they different? Coyote vs. Wolf: Can You Spot The Differences? Search And Rescue Dog vs. Police Dog: How are they different?